The cool colors of the Lisa di Stefano painting that rests above the fireplace inspired the Christmas decor throughout the Willetts' home. 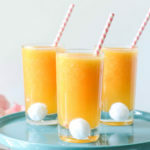 Photos by Melissa Oivanki. 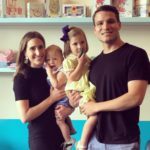 Keeping calm and carrying on is more than a motto for the Willett family. It’s the mantra behind their Bocage neighborhood home’s overall aesthetic, with its soothing vibe dictated by cream-colored walls and furnishings in muted shades. The neutral palette provides a serene backdrop for cool-toned abstract paintings by local artists. But come Christmas time, this subdued setting gets an unexpected boost of seasonal spirit drawn from the most lively shades plucked straight from the canvas. A single poinsettia makes a simple but bold statement in the all-white kitchen. The Willetts called upon local designer Shane Griffin to capture their colorful vision. The starting point for the project was the family’s collection of aqua- and turquoise-colored glass ornaments, many of which were decorated by Louisiana artists. “We love to support local small businesses and artists,” Sunshine says. The vivid color scheme was carried throughout the vaulted-ceiling living room. Griffin tucked a grouping of ornaments in the large glass vessel containing an orchid on the coffee table, and he paired the main turquoise shade with apple green in a low-slung garland and ornament vignette on the mantel. 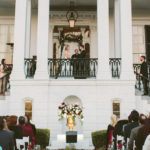 In the adjacent dining room, he topped a whitewashed buffet with a simple floral arrangement and a reindeer decked in seasonal boxwood, but he kept the oval dining table clear to allow for unobstructed views of three wreaths hanging on the outside of this room’s large windows. 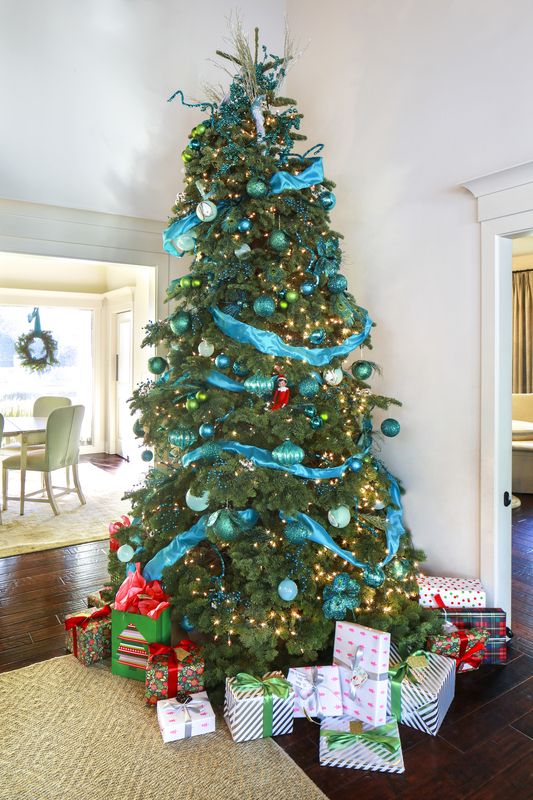 Vibrant turquoise and aqua blue ornaments, many handpainted by local artists, fill the tall tree in the living room. 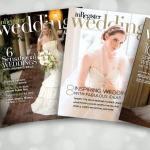 Designer Shane Griffin pulled the scene together with swirls of shimmering ribbon and coordinating finishing touches. But perhaps the most meaningful moment spent surrounded by these colorful decorations will happen when the family wakes up on December 25. 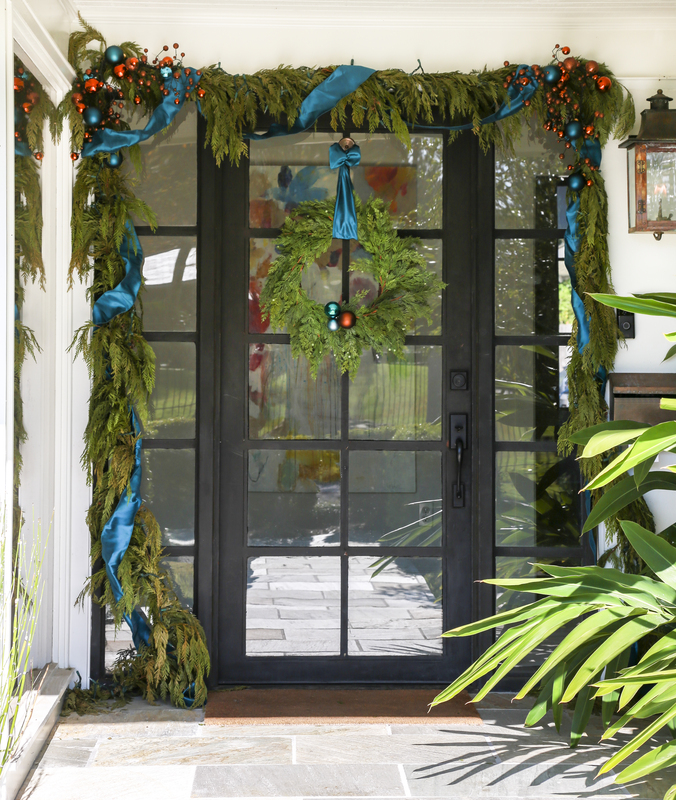 Griffin gave the modern-style front door a haute holiday look with fresh cedar garland from Louisiana Nursery Outlet adorned with tiny white lights, as well as a fresh wreath suspended with turquoise ribbon and accented by a small cluster of chocolate and turquoise ornaments. 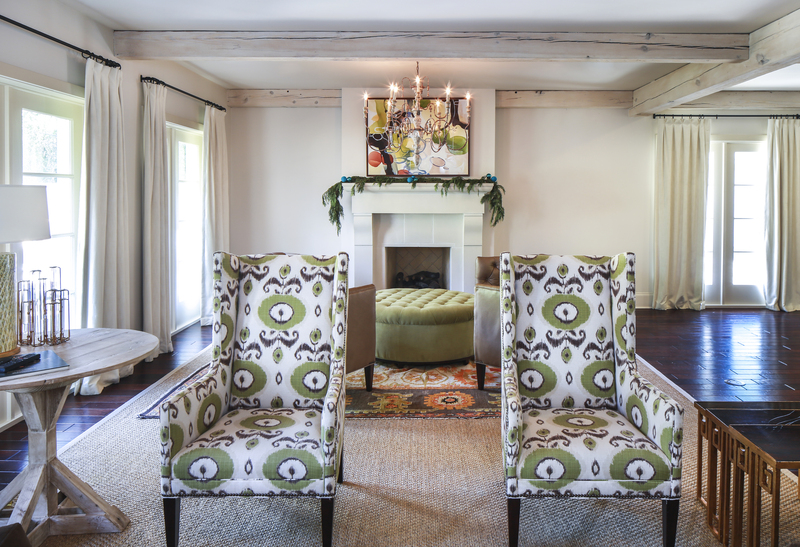 Pops of green in the family room provide the perfect backdrop for holiday trimmings, including a fresh garland on the mantel below a painting by Chuck Voelter. The neutral palette of the dining room allows the lush outdoor scene, including a row of fresh wreaths, to be the focal point through tall windows. 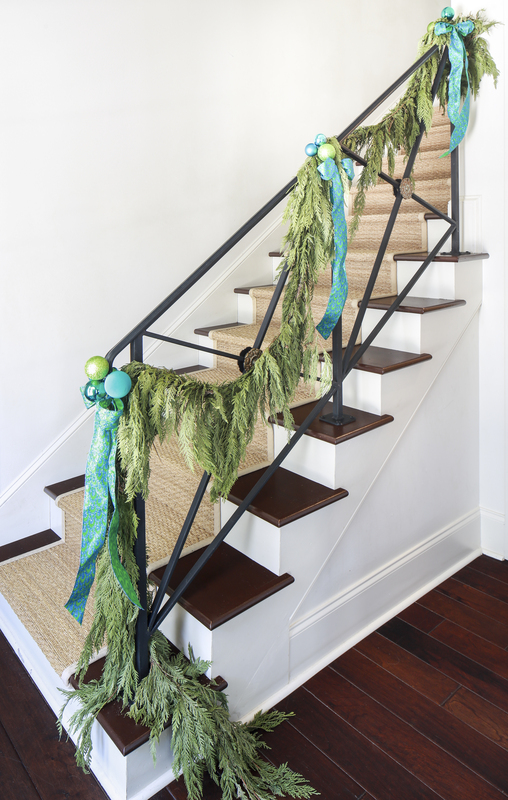 The black iron stair rail gets dressed up for the holidays with fresh cedar garland festooned with classic Christmas ball ornaments in unexpected colors. A compact arrangement of hydrangeas and a resting boxwood reindeer adorn the buffet in the dining room, with a clear view of the turquoise-themed tree in the adjacent living room. 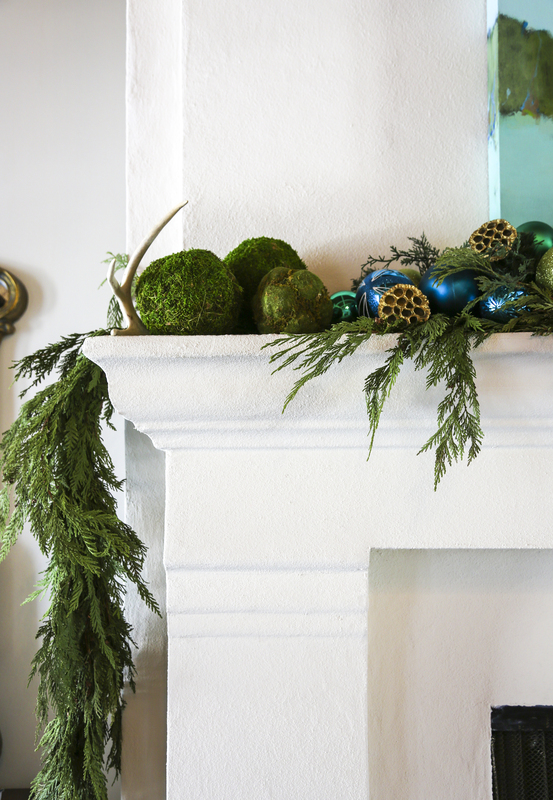 Antlers, moss-covered spheres and glittered ball ornaments add texture to the living room mantel.